Just in time for the cold season, The Tea Spot has launched a new ‘Cold Buster’ herbal tea blend with Tulsi holy basil leaf. The Tea Spot's CSR Katie Young said "This new blend smells and tastes heavenly. I'm sure it will make lots of our customers very happy!" The Tea Spot is introducing today a new Cold Buster Tea with Tulsi, based on a European herbal remedy recipe. ‘Cold Buster’ boasts Vitamin C and antioxidant content, from a variety of phytochemicals and is naturally caffeine-free. Additionally, Tulsi holy basil leaf and rooibos tea are both strong natural sources of antioxidants. The Tea Spot’s goal in reformulating their popular ‘Cold Buster’ herbal tea is to make the seasonal wellness tea blend as delicious and appealing as their signature gourmet blend. Handcrafted in Boulder, Colorado, this new herbal tea is made with red Rooibos, ginseng, Tulsi holy basil, lemon peel, orange peel, hibiscus, ginger root, rose hips, cinnamon, rose petals, marigold flowers, orange, cinnamon and vanilla flavoring. By adding Tulsi holy basil leaf to the new blend, The Tea Spot is able to boost the loose herbal tea blend’s phytochemical content. Tulsi holy basil also makes “Cold Buster’ more aromatic, thanks to the essential oils in the Tulsi leaves. The Tea Spot's Customer Service Representative, Katie Young, is excited to see 'Cold Buster' make its return to their loose tea list just in time for cold season. She said "I've been getting lots of requests from wholesale and online customers about when 'Cold Buster' will be coming back. This new blend smells and tastes heavenly. I'm sure it will make lots of our customers very happy!" The history of herbs and spices is far more ancient than that of tea. 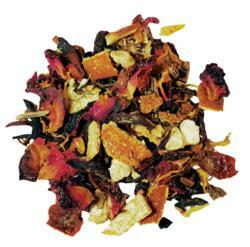 Herbal infusions are not tea, per se, as they are not made from the Camellia sinensis plant. They are, however, popular beverages in the U.S. and are naturally 100% caffeine-free. Many claim a variety of benefits, and, like tea, can offer deliver a sensational experience in aromatherapy and taste. The new ‘Cold Buster’ has a refreshingly luxurious flavor. Herbal tea drinkers looking to find full leaf blends packed with an array of Vitamin and antioxidant-rich constituents will find ‘Cold Buster” to be a perfect choice as a seasonal herbal loose leaf tea. ABOUT THE TEA SPOT: The Tea Spot is a for-profit philanthropic business producing handcrafted loose leaf teas and Steepware® - the tools that make loose tea easy. The Boulder, Colorado-based woman owned and operated company was founded by Maria Uspenski in 2004. A cancer survivor drawn to the health benefits of leaf tea during her recovery, she set forth to modernize the loose leaf tea experience. Her message is simple and powerful: tea in its freshest form renders incredible flavor, unmatched health benefits, and is eco-friendly. The Tea Spot is a Certified B Corporation and ensures that its products uphold clean, sustainable and fair manufacturing standards. The company's model of social entrepreneurship incorporates a culture of giving as it grows: ten percent of every sale made is donated in-kind to cancer and community wellness programs.